This pretty floral attachment is for 1.2mm (or 16 gauge) internally threaded body jewellery such as barbells or labret studs, it is made out of Grade 23 Titanium and the thread on them is 0.9mm thick. Internally threaded jewellery is very popular in body piercing because it is easy to insert and less likely to cause any irritation when fitted because the whole bar is smooth and the thread is on the end. 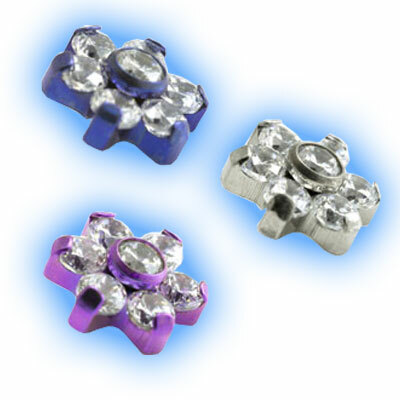 This design is a pretty 6 petal flower with stunning clear crystals set in Titanium, it is very unusual and looks amazing in piercings. "Fantastic service and fantastic goods." "Amazing selection to choose from and when you finally decide what you want... it is delivered super quick. Amamzing quality. Very happy customer..."
"Great communication with seller, asked to keep straight and not bent. Great product with rapid shipment. they feel great and i'm very happy. Thank you"